Speeches that George W. Bush made shortly after the 9/11 attacks, are turned into poetry in this book. The tone varies as we witness consolatory words and war speech. What does not change is the intensity of the rhetoric used. The poems first appeared in the Dutch literary magazine Armada, tijdschrift voor wereldliteratuur, No. 24, December 2001. The edition is printed on a paper that adds its own voice to the project in the form of a watermark. It reads “conqueror”, the brand name of the paper. Not only does that word seem to describe the voice in the book, it is also a description of itself; the watermark as a rhetoric, as a conquest. 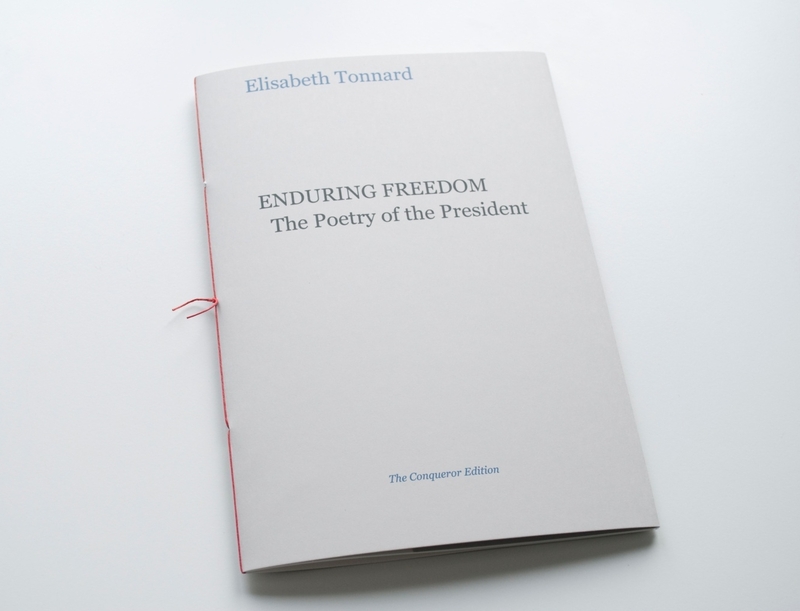 The edition is limited to 124 numbered copies. Published in Leerdam, The Netherlands, September 2011. Handbound, 15×21 cm, inkjet print, 16 pages. Priced at 18 euro, plus shipping. Order through webshop. Order through email. View some images of the book here. Read a review (in Dutch) by Erik Lindner in De Groene Amsterdammer. The book is included in the collections of Albertina Bibliothek (Vienna), Bayerische Staatsbibliothek, Bibliothèque Kandinsky (Centre Pompidou), the Brooklyn Museum, Jan Michalski Foundation for Writing and Literature, Kunstbibliothek (Berlin), MACBA (Museu d’Art Contemporani de Barcelona), MoMA Library, National Library of The Netherlands (Koninklijke Bibliotheek), Oxford Brookes University, The Poetry Library in London, Tate Library and Archive, Zentralinstitut für Kunstgeschichte (Munich). Tonnard reduces these texts – eliminates the noise. She divides them into lines of poetry, arranging the words into strophes. She uses English words and somehow they also become a part of Dutch poetry. She unmasks this rhetoric in a subtle manner while at the same time acknowledging its value.